It was the evening of August 11, 1960. Ralph Boston had one of the best prime ribs he had ever had at steakhouse, Red Tracton’s, and was settling into a good night’s sleep before the United States track and field meet at Mt San Antonio College (Mt. SAC) in Los Angeles. This was the last tune up for American track and field athletes before the 1960 Rome Olympics. Rooming with three-time Olympic triple jumper, Bill Sharpe, Boston engaged Sharpe in some pre-sleep braggadocio. August 12, 1960 went on to become a historic day in American track history as over 8,600 spectators at Mt SAC saw Americans break four world records – including John Thomas’ high jump of 2.18 meters (7’ 2”, Bill Nieder’s shot put throw of 20.06 meters (65’ 10”), and Hal Connolly’s hammer throw of 70.33 meters (230’ 9”). The biggest world record to fall that day was one that had stood for over 25 years – Jesse Owen‘s long jump of 8.13 meters (26” 8 ¼”). And the record breaker was Ralph Boston, with a leap of 8.21 meters (26” 11 ¼”) that bettered his personal best by half a foot, and Owens’ record by three inches. Jesse Owens and Ralph Boston in Rome. The fact of the matter is, Boston didn’t know Owens and had never talked to him. As he admitted, he had just turned 21 that August. “I’m a neophyte. I don’t know what the heck is going on. And I’m trying to be what we call in the hood, ‘cool,'” but instead ended up sounding like a disrespectful kid. But there was no denying it. Ralph Boston was now the favorite for gold in Rome, and was famous. Reporters asked him for interviews and passersby asked him for photos, including a GOAT to be. This is part two of Faces of Tokyo, a series of posts on how Dentsu wanted to portray the Japanese to foreign visitors of Japan, as explained in a set of pictures and profiles of Japanese and the work they do. The profiles below, from the book, “Tokyo Olympics Official Souvenir 1964,” are intended to leave the foreign reader the impression that the Japanese, in 1964, are indeed savvy internationalists. Ballerina: She’s been to Europe twice to study dance and performed with a visiting opera company from Italy in 1963. On top of that, ballerina, Yukiko Tomoi, was given the task of organizing a special performance of La Turandot during the Tokyo Olympics, not only for the Japanese who grew up loving classical European music and dance, but for the Westerner who needed assurances that the Japanese were not all shamisen and kabuki. The Artist: Not only do the Japanese know ballet in 1964, they know how to paint using techniques introduced to Japan from Western Europe in the Meiji Period. Featured here is Takeshi Hayashi, an established painter and professor of the Tokyo Art Museum. Dentsu even mentioned artist Tsuguji Fujita, a Japanese artist who moved to Paris, and even traded in his Japanese passport for a French passport. Fashion Model: Dentsu selected Reiko Kawasaki as the face of the young model, likely because she evokes a young Audrey Hepburn. There’s very little detail in this profile, except that she has been a model for three years “who has not attempted to get ahead faster than her shadow.” More interestingly, the profile refers to Akiko Kojima, who was crowned Miss Universe in 1959, the first ever from Asia. A triumph over the beauties from Norway, the US, England and Brazil, Kojima’s victory was yet another milestone in Japan’s march to international acceptance. Fashion Designer: She was one of the biggest names in fashion in Japan. Hanae Mori in 1964 was particularly well regarded for her costume designs in film. A year later, she debuted internationally with a show in New York City, and 12 years later opened up shop in Paris. It’s the Olympics. You’re a football player with blazing speed, and you’re prepping to win gold, to be crowned the fastest man in the world. Hayes, like the best high performance athletes, was focused on his mission. Gold in the 100-meter finals. Gold in the 4×100-meter relays. It is hours before the finals of the 100-meter dash on October 15. Hayes is sitting in his room in the Olympic Village with the hopes of keeping himself calm. His roommate, long jumper Ralph Boston, is lying on his bed, keeping to himself. Needless, to say, the eventual gold medal and heavyweight champion of the world was a distraction. Not getting the reaction he wanted, Frazier began rummaging Hayes’ bag for gum, stuck it in his mouth, and left. Not only did Farrell wear the same size shoe, he also wore the Adidas 100 shoe that Hayes’ did. Now, properly attired for battle, Hayes lined up. And then he learned that Hayes was placed in lane 1. Lane 1 is the innermost lane on the track, and the cinder track had been chopped up by some three dozen race walkers for three circles before heading out on the rest of their 20K journey. Don’t the fastest runners in the semis get the choice middle lanes? Not at the 1964 Tokyo Olympics, where sprinters were assigned lanes randomly. He did. Convincingly. Watch the video from the 3’ 55” mark to watch the black and white footage of the race. The angle is long enough to show the entire field. And you can see Hayes dominating the field from start to finish. Fastest Man in the World. By far. You’re 18 and you’re about to do battle on the biggest boxing stage there is – the Olympics! Spaniard Valentin Loren stepped into the ring with fellow featherweight, Hung-Cheng Hsu of Taiwan, but ended up having a bigger fight with the other person in the ring. 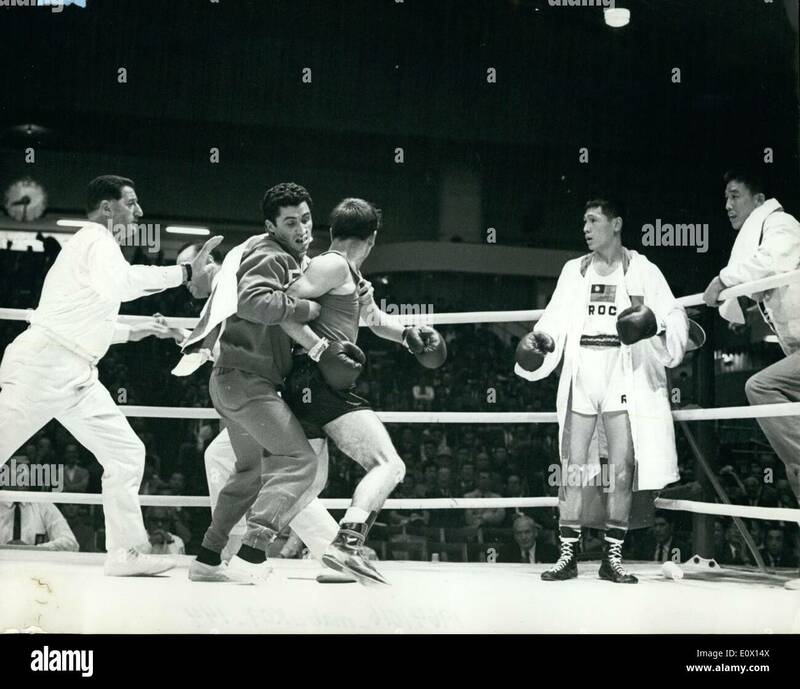 There are very few details about Valentin, Hsu or this first round fight at the 1964 Tokyo Olympics. According to the press on October 14, 1964, Loren was “consistently fouling” the Taiwanese boxer, and the Hungarian referee had seen enough. In the middle of the second round, the referee, Gyorgy Sermer, suddenly disqualified Loren. Furious upon understanding that his Olympic career had been stopped only minutes into it, Loren began chasing Sermer around the ring before landing a few punches. Loren’s left hook to Sermer’s face, likely Loren’s best punch of the night, was plastered in newspapers around the world. That day, the Amateur International Boxing Association executive committee met in an emergency meeting. The room must have been tense as the committee actually brought Loren and Sermer together before declaring a ban on Loren from Olympic and amateur boxing competition for the rest of his life. Happy 2nd Anniversary! The Best of 2017 Part 2: Airbnb, Shoplifters, and Drones Oh My! The Olympians has been a labor of love for exactly two years. It is my sketchbook as I prepare for the mural masterpiece, a book on the 1964 Tokyo Olympics. While my book’s focus is on the XVIII Tokyo Olympiad, I use my blog as an excuse to write about anything even remotely related to these areas: the Tokyo Olympics, the Olympics overall, Japan, and sports in general. In other words, I think of my blog as therapy for a restlessly curious mind. How else could I go 730 straight days without missing a post? A Visit With a Japanese Family in 1964 Part 1: East meets West, but Don’t Worry – They’re Westernized! The Pressure is On: With Fabled Golf Clubs Opening Up to Women, Will the Kasumigaseki Country Club Follow? Running a Marathon in August in Tokyo: Hot Town! Summer in the City! Back of My Neck Getting Dirty and Gritty! It’s been exactly two years since I started my journey to understand the context, the organization and the stories of the 1964 Tokyo Olympics. My father was at those games as a news producer for NBC, and I turned one years old on Opening Day. I moved to Tokyo for a third time in January, 2014, excited by Tokyo’s selection as the host city for the 2020 Summer Games. Surprised to find not a single book on the 1964 Tokyo Olympics in English, I endeavored to write the definitive record. On May 1, 2015, I started my blog, The Olympians is in many ways, the first draft of my book. All, thank you for your wonderful comments and support! Pita Nikolas Taufatofua put Tonga on the map during the opening ceremonies of the 2016 Rio Olympics. Carrying his nation’s flag, his torso bare, muscles rippling and golden skin gleaming, Taufatofua had tongues hanging and wagging. But Taufatofua didn’t last the entire bout of even his first match, eliminated from the Olympics due to mercy rules, losing 16-1 to Sajjad Mardani. To be fair, Tonga is so small, the Pacific archipelago’s population is a bit above 100,000, which is probably about the population of my neighborhood in Tokyo. So the numbers alone make it unlikely for a world champion to emerge from Tonga. But the tiny kingdom of Tonga, participating in the Olympics since 1984, beat the odds and claimed a silver medal in 1996. Paea Wolfgramm was a student at the university of Auckland in New Zealand where he played rugby when a schoolmate suggested that Wolfgramm give boxing a try in 1990. After 24 bouts in and around the Pacific islands circuit, Wolfgramm found himself the super heavyweight representative of Tonga, and was going to the 1996 Atlanta Olympics. Wolfgramm was a big man, 185 cm tall and 140 kgs in weight, but as he had no international track record, he was a total unknown among the American, Cuban and European boxers expected to medal. First up for Wolfgramm was a boxer from Belarus, Sergei Dahovich, whom Wolfgramm snuck by on points, 10-9. This set up a match with the Cuban, Alexis Rubalcaba. The Cuban boxers were always considered a threat. But Wolfgramm, a devout Morman, surprised essentially everyone, taking the fight to Rubalcaba, pummeling him at the ropes, and sending the Cuban to two standing eight counts. Wolfgramm won on points 17-12, and in that moment, to the chants of “Ton-ga! Ton-ga!” from the Atlanta crowd, went from unknown to unbelievable. The entire island nation of Tonga was already celebrating its greatest Olympic moment as Wolfgramm had secured the nation’s first medal, guaranteed a bronze medal with the Cuban’s defeat. While the match between Wolfgramm and the Nigerian boxer Duncan Dokiwari was not televised in Tonga, the entire populace was on pins and needles when Wolfgramm took to the ring for semi-final bout. The fight between Wolfgramm and the 1994 Victoria Commonwealth Games champion was a tight affair, tied 6-6 going into the third and final round. And the match stayed tied at 6 until the very final seconds, when Wolfgramm landed a punch to Dokiwari’s face to get the decisive point. Wolfgramm was going to the gold-medal round! The Tongan did not win, although he made the fight a fight. After the second round, Wolfgramm was down only 3-2. But the third round was the Ukrainian’s. Klitschko pummelled away, and won the gold-medal match 7-3. Despite the lack of resources and support, the broken nose and wrist, Wolfgramm battled for himself and for an entire nation. Of his wrist, Wolfgramm was quoted as saying, “I was willing for it to break into 2,000 pieces if necessary. Wolfgramm would turn professional soon after the Atlanta Games, and go onto a successful career, winning his first 14 bouts, and retiring with a career record of 20-4. Robbie Brightwell was a 16-year old student in Shropshire, England, and was straining to keep his eyes open while doing research in his local library when he came upon an old magazine and was struck by a picture of runners in a competition sometime in the late 19th century. As he related in his autobiography, Robbie Brightwell and His Golden Girl, he was surprised to see that in an area called Much Wenlock, not far from his own, there was a sporting event called “The Olympics”. Intrigued, Brightwell, who went on to captain Britain’s track and field team at the 1964 Tokyo Olympics, began impromptu research into the Much Wenlock Games, and learned that Baron de Coubertin, at the age of 27, came to Much Wenlock and met an 81-year-old English physician, who planted the idea for what we now recognize as the Modern Olympics. But as is true with any great endeavor, new ideas and initiatives are often built on earlier iterations. According to The Games: A Global History of the Olympics by David Goldblatt, events held in both England and France could be considered precursors to Coubertin’s Olympics. The Cotswold Games: In the early part of the 17th century, fairs and festivals were a common part of the English country lifestyle. One of the biggest in England was the Cotswold Games in Chipping Camden, a mixture of fun and sports, contests and gambling. As can be seen in the poster for the Cotswold Games, also known as the “Cotswold Olimpicks”, there was a mock castle created on a hill, in front of which was the main theater for the events. Developed by Robert Dover, a “charismatic and charming man”, the Cotswold Games featured “hare coursing and horse racing, wrestling and shin kicking, stick fighting and hammer throwing.” Dover established this country fair in 1612 and was able to organize the Cotswold Games for about 30 years. Unfortunately for Dover, and perhaps the community of Chipping Camden, the 1630s saw a shift from the hedonistic reign of King James I to a more conservative, puritanical approach of Oliver Cromwell, who overthrew the King in 1645. That put an end to the Cotswold Games. The Republican Olympiad: When the French monarchy was overthrown in the French Revolution of 1789, leaders of the new republic were excited about change to come. One of the leaders of the revolution, Charles Gilbert Romme, devised a way to update the calendar for a new, enlightened France. With five days added to the year, with the inclusion of another day added to a Leap Year, which would take place every four years. According to Goldblatt, “Romme thought that the lead day might be a good occasion for staging public festivities and games: ‘we suggest calling it the French Olympiad and the final year the Olympics Year.” In 1796, the first Republican Olympiad was held in Paris, where hundreds of thousands came out for games, music, dancing, running and wrestling. Winners of competitions won wreaths of laurels, pistols, sabres, vases and watches. The Republican Olympiad continued for two more cycles, but died out before the start of the 19th century. Pablo Fanque’s Travelling Circus Royal: As Goldblatt noted, the Olympics were often more often associated with circuses in the 18th and 19th centuries in England. One of the most popular traveling circuses was called Pablo Fanque’s travelling Circus Royal, which offered an “unrivalled equestrian troupe” and ” new and novel features in the Olympian Games.” Pablo Fanque was said to be the most popular circus proprietor in a golden age of circuses in Victorian England, and was quite accomplished not only as an equestrian, but also as a master of the corde volante. But as you may be able to tell, Fanque’s association to the Olympics is peripheral at best. His association to The Beatles may be stronger. 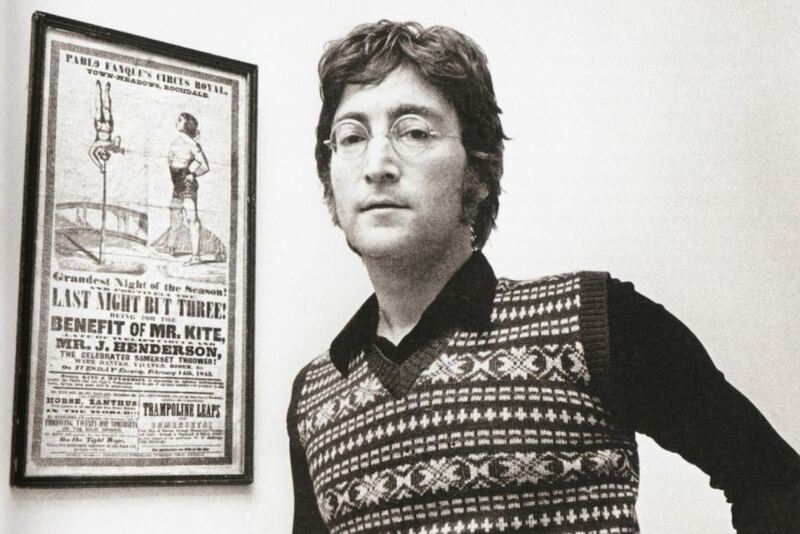 The album, Sergeant Pepper’s Lonely Hearts Club Band” featured a song called “Being for the Benefit of Mr. Kite“, the lyrics of which are primarily lifted from an 1843 poster marketing Fanque’s Circus Royal. The Much Wenlock Olympian Games: Dr Penny Brookes of Shropshire, England, agreed with the thinking of the time, that it was important to promote “the moral, physical and intellectual improvement of the inhabitants of the town…by the encouragement of outdoor recreations and by the award of prizes annually at public meetings for skill in athletic exercises and industrial attainments.” The first Much Wenlock Olympic Games were held in 1850. While these Olympic Games were a rural fair, they also had a firm sporting focus. In addition to fun events like wheelbarrow and sack races, both amateurs and professionals competed in cricket, football, archery, hurdling, running, shooting, cycling and a pentathlon. Large cash prizes were awarded. When Baron de Coubertin, was told about the Much Wenlock Olympic Games, he made it a point to visit and meet Dr Brookes, a seminal act in the origin story of the modern Olympic Games. Today, the modern-day Olympics are held over a two-week period, or 16 days because it covers three full weekends. But back in the day, way way back in the day – say over 2500 years ago – The Olympia Games were a five-day affair, as is explained in the book, The Games: A Global History of the Olympics, by David Goldblatt. In the 5th century BC, athletes, trainers and their families took an oath “that they would be guilty of no foul play and that they would be fair and not accept bribes.” But as we find inconsistency at times between what athletes promise to do and what they actually do, we find human behavior hasn’t changed much over the millennia. According to Goldblatt, “there was plenty of cheating and plenty of bribery.” He went on to say that the many statues of Zeus that adorned the area of the sporting grounds were paid by with fined for rule breakers. Day Two: According to Alan Carter’s book, The Olympic Glory That Was Greece, the second day was devoted to competitions for boys. The morning saw heats after heats of foot races as the qualifiers are shrunk down to the finalists. The victor receives a palm leaf, and his family and home town are honored by his grand accomplishment. 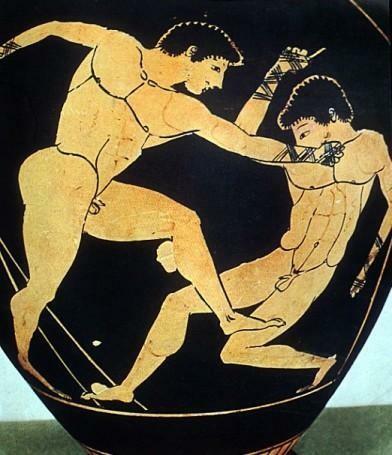 The afternoon sees competitions in wrestling and boxing for the boys, as well as what could be considered a mixed-martial art called the pankration. Carter described it as “training for warriors who would be engaging in hand to hand confrontation with the enemy and Sparta was particularly associated with the sport.” In the pankration, you could bite or gouge eyes. Day Three: On the third day, according to Carter, spectators enjoyed chariot races at the hippodrome. There were some six variants of chariot races – two and four-horse competitions, two mules, or foals as well – and they ran anywhere from 3,500 to 14,000 meters long. Below is a clip from the 1959 film Ben Hur, which is supposedly Rome in AD 26, over 680 years after the establishment of the four-horse chariot race. If the chariot races in Olympia were anything like this, I could see why this was a must-see event! Day Four: Goldblatt wrote that day four was the day for generalists, when the pentathlon was held. The pentathlon then was made up of five events: the discus throw, the long jump, the javelin throw, a foot race and wrestling. According to Goldblatt, the competitors faced off in a footrace, the discus, the javelin and a jump that may have included weights. The winner was often determined after these four events. In the a winner could not be decided, wrestling was the tie breaker. The order and the way the winner was decided apparently is unclear and still debated. Again, due to the sketchiness of the historical accounts, there is debate as to what happened on the fourth day. According to Carter, Day Four was a festive days, starting with the slaughter of 100 oxen in honor of Zeus. This was followed by the premier events, the stadion (200 yard foot race), the diaulos (400-yard foot race), followed by wrestling, boxing and pankration. Day Five: Goldblatt wrote that day five is running, wrestling, boxing and “pankrating” (if I can turn that into a gerund). But Carter wrote that it is about pomp and circumstance, focusing on awarding the victors at the Temple of Zeus. The winners are announced with trumpets and declarations of their names and hometowns. They are given a palm leaf to hold and a wild olive branch to wear as a crown. After that, its feasting and partying into the night. Holyfield knocking out Barry and then Barry being awarded victory. He was the dominant heavyweight boxer of the 1990s, successfully earning the heavyweight title three times, something accomplished previously only by Muhammad Ali. But unlike Ali, who was an Olympic champion, winning gold at the 1960 Rome Olympic Games, glory escaped Evander Holyfield at the 1984 Olympic Games. The youngest of nine children from Almore, Alabama, Holyfield grew up in a crime-infested neighborhood, finding respite as a seven-year old in boxing. Winning at every level as a pre-teen and teenager, Holyfield rose to international prominence by winning silver at the 1983 Pan American Games in Caracas, Venezuela. In 1984, he found himself representing the United States on the boxing team at the Los Angeles Olympics as their light heavyweight contender. While spectators did not know much of Holyfield at the commencement of the Games, they certainly were aware of the rock solid boxer whose punishing body shots with the right, and hooks to the face with the left were making a case that Holyfield was destined for gold. He mowed down the competition in increasingly ruthless fashion, with the referee stopping the contest early in his first two bouts. 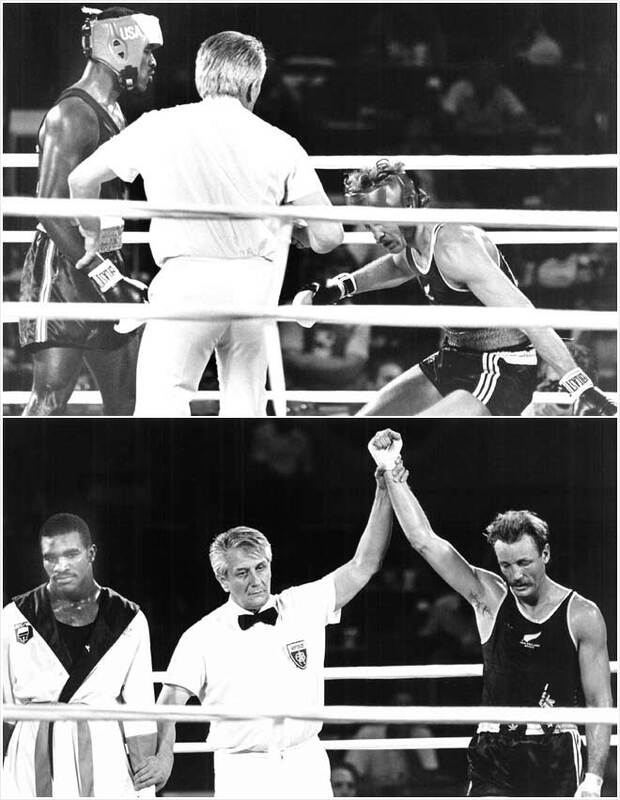 Holyfield knocked out his quarterfinal opponent in the first round, setting up a match with Kevin Barry of New Zealand. Holyfield dominated the fight. Blocking most of Barry’s punches, Holyfield landed hooks and body blows fairly regularly. Barry was cautioned a few times for clinching by holding the back of Holyfield’s neck, as that was his only way of slowing Holyfield down. A telling moment came in the middle of the first round when Holyfield landed what the announcer called a “stinging left”, which turned Barry’s legs to jelly. The referee, Gligorije Novicic of Yugoslavia, reached in to break the fighters apart, but Holyfield managed to land another solid right. Barry was given a standing eight, and looked to be in trouble as the first round ended. The second round started somewhat cautiously for the first 30 seconds, until Holyfield landed two lefts to Barry’s gut, the Kiwi’s knees buckling momentarily. Barry, stopped Holyfield’s momentum by again holding the back of his neck. After that Holyfield began to land shots to the head and body relentlessly until the fight was stopped when the referee deducted a point from Barry’s scorecard for, I believe, hitting Holyfield late after telling them to stop. Soon after that, Novicic stopped the fight to caution Holyfield for something that seemed unclear. Soon after Barry was cautioned for a couple of rabbit punches to Holyfield’s head. Soon after Barry is cautioned for holding the back of Holyfield’s neck. Another caution for Barry. And again, another point stripped off of Barry’s score. The fight essentially deteriorated into a herky jerky rhythm of starts and stops, primarily due to the Novicic’s need to caution and warn Barry. Then suddenly, the fight was over. With fewer than 20 seconds left in the second round, with Barry holding the back of Holyfield’s neck yet again, Holyfield delivers a hard right to Barry’s mid-section, and at the moment Holyfield lands a second right to Barry’s stomach, the referee shouts “stop”. A split second later, Holyfield delivers a crushing left hook to Barry’s right check that sends the New Zealander to the mat. Barry gets up, but the referee counts him out. Barry has been knocked out. Soon after, the referee calls Holyfield over and says something that sends Holyfield away in clear disgust. Novicic has disqualified Holyfield, apparently for punching Barry after saying “stop”. And just like that, the fight is over and Barry has won the fight. And when the two boxers are standing at the side of the referee, and raises the right hand of Barry in victory, Barry grabs Holyfield’s right arm and lifts it in the air. For all to see, Barry wants people to know he thought Holyfield was the winner. Ironically, there were no real winners in the light-heavyweight competition in Los Angeles. Holyfield was disqualified, and therefore lost his chance to advance to the gold medal round. And ironically, because Barry was knocked out with a shot to the head, the rules dictated that he was “automatically rendered ineligible to fight for 28 days”, according to this article.In other words, no gold medal match for him either. The result was extraordinary. The gold medal went to Anton Josipovic of then-Yugoslavia, who did not have to throw a punch to earn the right to the top of the medal podium. The result was protested by the United States and the protest was denied. But in an unusual act of sympathy or compromise, the protest committee agreed to award the bronze medal to Holyfield despite his disqualification. When Josipovic accepted his gold medal, he did what he thought everyone knew. He pulled Holyfield up to the top step. When Holyfield stepped off the podium, he was smiling widely, a classy finish to a boxer who would go on to win his next 28 fights as a professional, and become one of the world’s greatest boxers of all time. Identity / Proudly powered by WordPress Theme: Hive.